Thank you to our state wide NBC Affiliate here in Maine for their comprehensive coverage of FLOW Fort Knox! FLOW is an event series produced by the Coaction lab in association with the Intermedia MFA and New Media undergraduate programs at the University of Maine and in collaboration with the Friends of Fort Knox. This event series is focused on water as a precious resource that connects and supports the diverse range of living systems on our planet. This year’s event is in collaboration with Intercreate.org, host of SCANZ 2017 Ocean + Energy an international biennial. Intercreate is an organization exploring projects at the juncture of art, science, culture and technology. 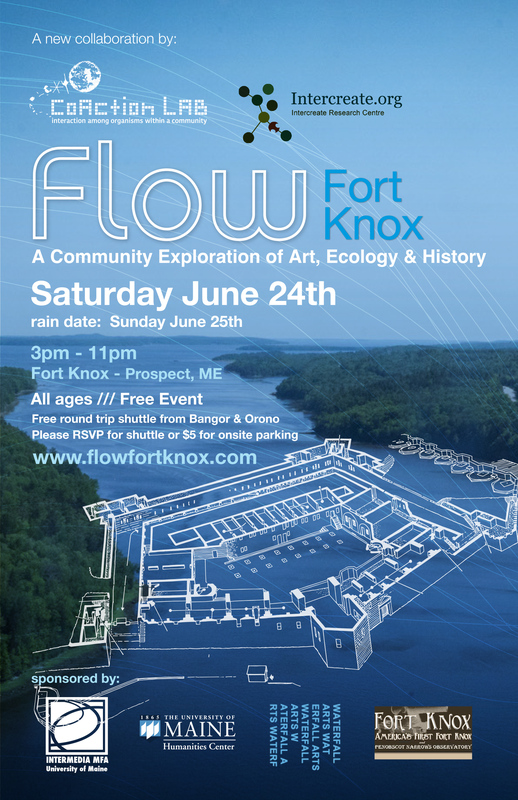 Last year’s event took place at the Thomas Hill Standpipe in Bangor ME and this year’s FLOW Fort Knox event will take place on June 24th 2017 at the historic Fort Knox and Penobscot Narrows Bridge and Observatory in Prospect ME, across the Penobscot river from Bucksport ME. This event has been sponsored in part by grants from the University of Maine College of Liberal Arts & Sciences, the Cultural Affairs/Distinguished Lecture Series Fund and the University of Maine Humanities Center.